Preheat your oven to 180C. Place the whole tomatoes in a small baking tray and drizzle over some olive oil and a dash of white balsamic vinegar. Add some salt and pepper and the sprig of thyme then roast in the oven for around 20 minutes or so (until you can see that some of the tomatoes’ skin has split). In the meantime, boil the giant couscous as per its cooking instructions on the packet then drain and refresh under the cold water tap to cool. Set aside. 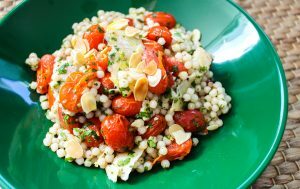 Pour a tablespoon or two of olive oil over the couscous whilst stirring it to coat it evenly (this will stop it sticking together). 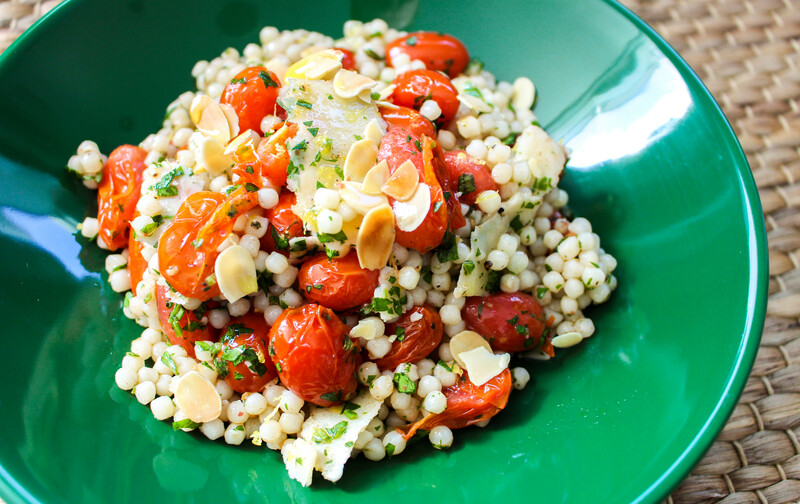 Transfer the couscous to a large mixing bowl along with the cooked tomatoes and their liquor. Using a potato peeler or a Parmesan cheese slice, slice thin strips of the Parmesan then add to the bowl. Add the lemon zest, garlic and the chopped parsley. Combine the ingredients then check the seasoning. Add salt and pepper to taste and another dash of white balsamic vinegar. Garnish with some flaked almonds then serve warm or cold.